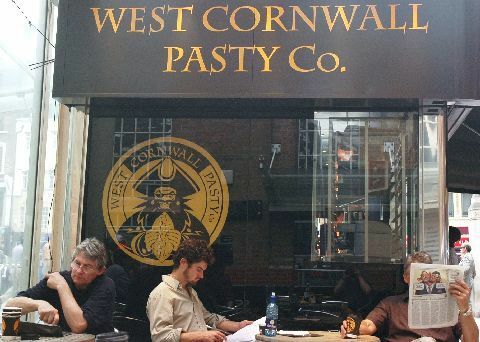 West Cornwall Pasty Co has several outlets throughout London and the UK, yet ironically none in West Cornwall. Londonist made a recent mooring at WCP’s Liverpool Street Station branch, and had a ‘Large Traditional’ for lunch. This ‘best-selling’ pasty was loaded with steak, swede, and potato, which for £3.20, provided a very filling lunch. From a previous after-the-pubs-have-closed reconnaissance mission, we can vouch that the onion and cheese pasty is a spot-hitter too! Other pasty pushers may be found at Liverpool Street Station and all over London, but WCP has that added draw of featuring a gnarly, bearded, patch-eyed pirate in its logo. Argh, Londonist be havin’ a soft spot for pirates. It is also noteworthy that WCPs are often located in close proximity to major chain coffee shops, where queues often verge on the ridiculous. It is worth pointing out that WCP sells a good line of coffee products - if somewhat less elaborate than, say, Starbucks’ menu - with generally short, fast moving queues.